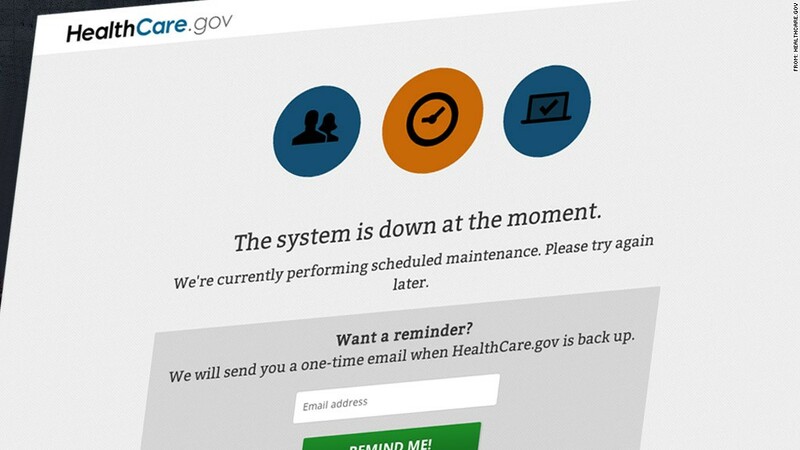 The Obamacare website was not working Friday. The federal Obamacare exchange website went down again for several hours on Friday, leaving consumers unable to sign up just days before the deadline to obtain coverage by Jan. 1. In the early afternoon, many visitors were greeted with a message saying the site had a lot of visitors and asked people to wait. By about 2 pm, the site appeared to be operating normally and users were directed to log in or create an account. Earlier in the day, applicants to healthcare.gov found a message saying that the system was down for scheduled maintenance. Visitors were advised to try again later or enter their email address to receive notice when the site is working again. The exchange's tech team encountered an error during routine maintenance on Thursday night, said Joanne Peters, a spokeswoman for the Department of Health and Human Services. Repairs began at 10 a.m. Friday and were estimated to take two to three hours. The outage came shortly before President Obama was set to hold a news conference before leaving for vacation. And it came at a very inopportune time for the rollout of Obamacare. Americans in the states using the federal exchange have until the end of Monday to pick a plan on healthcare.gov to be eligible for coverage beginning Jan. 1. The administration has said that those who encounter problems signing up can qualify for a special enrollment period, but it has not provided details on how it would work. As 2013 draws to a close, administration officials are scrambling to smooth over remaining Obamacare problems. Late Thursday, the White House announced that individual policy holders who received termination notices could qualify for a hardship exemption and buy catastrophic plans on the exchanges. And, after pressure from the administration, insurers announced applicants could pay their first month's premiums as late as Jan. 10 and receive coverage retroactive to Jan. 1.